Earth Day Pledge Ideas – Make an Earth Day Pledge to help kids feel like they are making a contribution to the future of our environment and the health of our planet. The choices we make today will create the world of tomorrow… Let’s pledge to do our part to leave it greener than we found it! Make a Pledge to the Earth to make this world a greener more sustainable place to live with these 6 fun Earth Day pledge Ideas. Choose from any of the Earth day pledge ideas listed below or find the inspiration to create your own pledge to the Earth, the planet, or nature. Make an Earth Day Pledge. The idea is to make a promise of some kind to honor the planet we live on and the natural world that surrounds us. There are a lot of fun ways that you can make an Earth day pledge. Below you can find some ideas to get you started. Make a commitment to make small changes. Doing this activity is a great way to get your kids thinking about how any little changes they make can add up to a BIG difference. 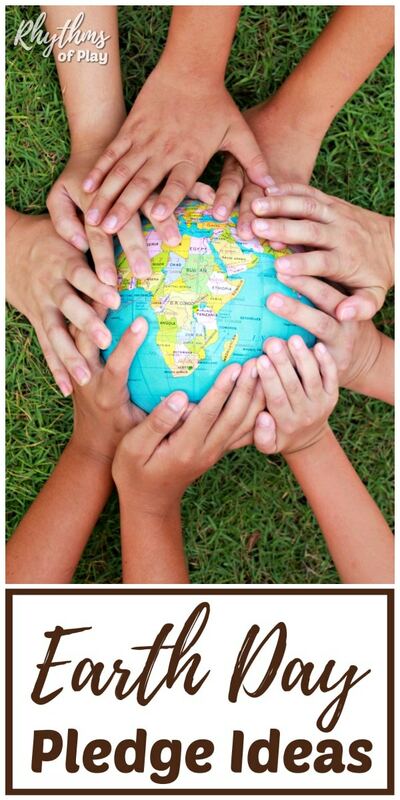 I found a great printable by Frugal Life Project Printable Earth Day Pledge for Kids that you can use for this pledge. Pledge to make one small change (that can make a BIG difference over time). I know a lot of people that are choosing to ditch the single-use plastic straw for portable stainless steel straws as their one small change. My daughter is one of them… and she was addicted to plastic straws–Yay!! All I needed to do was invite her to watch THIS YouTube video with me and she was totally on board–woot!! For more information and resources to create positive change in your life, have a look at Using the Power of Habit to Change your Life. No job is too big, and no action too small, the care of our earth is a job for us all. Place your right hand over your heart and pledge your allegiance. 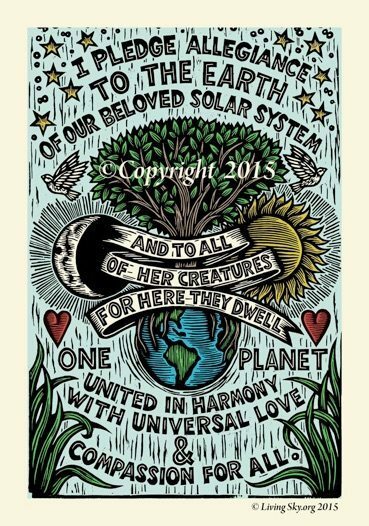 I pledge allegiance to the Earth… Or the planet, to nature, etc. Begin using your own words and complete it however you wish. You can find the poster below, and a few other posters you can use for inspiration, HERE. This pledge will help kids feel grateful for the planet and what the earth provides for them. Doing this activity helps kids gain a sense of connection and appreciation for the planet they inhabit. These thoughts can lead to positive changes in the way children relate to their world. Pledge your love by reciting a favorite poem, hugging a tree, climbing to the top of a mountain… do or say whatever works for you. Make a list of the things you love about the Earth, our planet, nature or the universe. One small change can make a world of difference. This is another way to help children see that every little thing that they do matters. Invite children to think about how they can protect the Earth or the natural world. Making this pledge to the Earth or nature can help kids understand that they CAN do things that create positive change in the world. Use the following prompt or make up your own. It’s amazing how powerful an Earth Day pledge can become when you say it aloud outside. It can be a very powerful experience for children. Take what you have written down, imagined, and/or created and turn it into an outside activity. You choose to have a small meaningful ceremony of some kind, or just simply state one or more of your pledges to the Earth. Make it something meaningful for you and your family (or your classroom) and you can’t go wrong. Celebrate Earth Day by making an Earth Day Pledge. This Earth Day activity helps kids learn that they can make positive changes to help make this world a better place to live. The choices we make today will create the world of tomorrow… Let’s pledge to do our part to leave it greener than we found it. 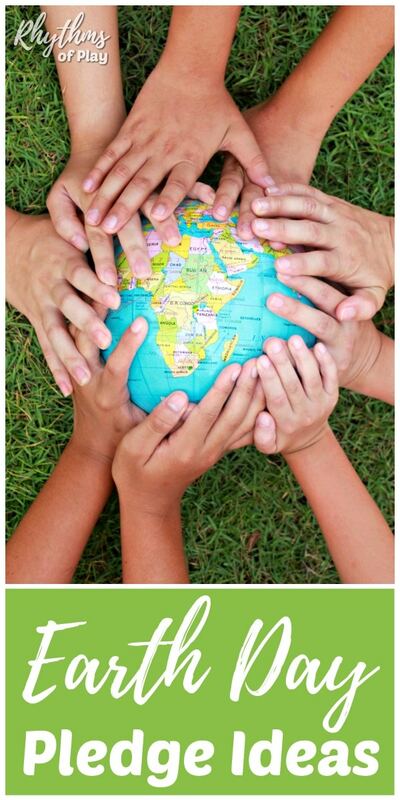 Don’t forget to check out Caring for the Earth: 12 Ways to Help Kids Get It. For more seasonal family fun check out our Seasons and Holiday’s Page. This is such a great guide to start children off with -thank you! What a sweet idea! LOVE the idea of pledging to make a change. Thanks Jennifer! We ended up doing a combo of all of them. I love the idea of making an Earth day pledge! Earth is simply love, it gives us lots of resources with no cost. Thanks, Caru! I agree the Earth gives us so much… It’s nice to pledge something in return. Have a happy Earth day!